This is your lake, your water, your future. Water is the foundation of our most critical systems. The decisions we make in each of these areas affect the water system as a whole. one of the world's great lakes and a public treasure. Carved by glaciers and fed by rivers, it’s now home to more than 10 million people, providing food, energy, jobs, and a comfortable way of life. But it faces many challenges, and its future is far from certain. Why? What do you think is the greatest challenge facing the lake? How did your choice compare? Was it difficult to select one? 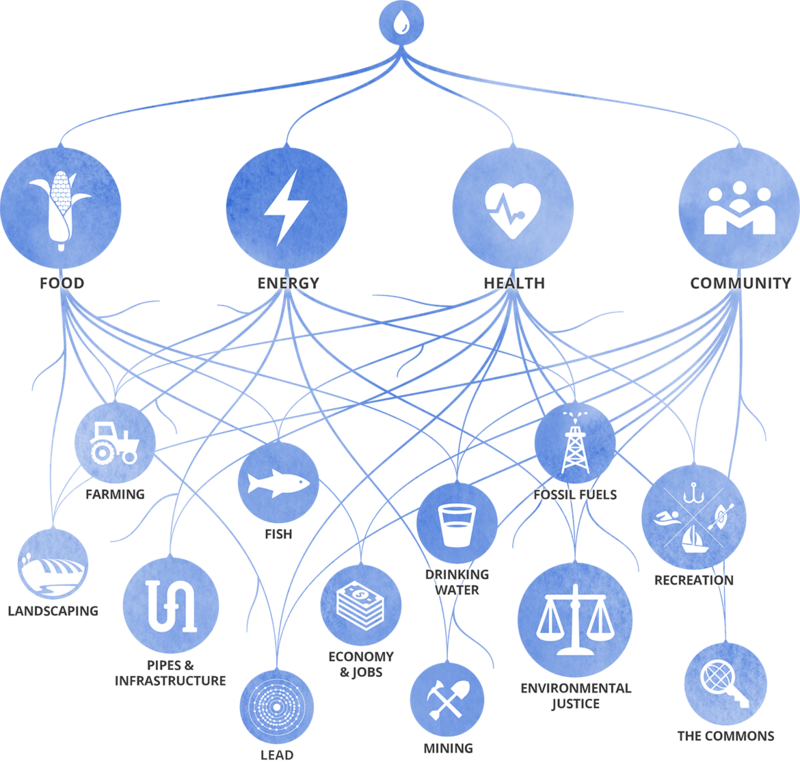 These challenges may seem daunting, but by exploring each of the systems supported by fresh water, we can find a way to connect to them, and reclaim our role as stewards of this shared place. Choose a starting point to begin your journey. Freshwater Stories is created and produced by the Freshwater Lab, based at the University of Illinois at Chicago. The Freshwater Lab is an initiative to communicate Great Lakes water issues to the general public, create tools to visualize the current state and future scenarios of water sources, engage unaffiliated groups in water planning, and train a new generation of Great Lakes leaders. As we focus on the Great Lakes basin, we also reach outward to build relationships with water stewards from other parts of the world. Together with our authors, partners, and Freshwater Lab team, the site was created by Sharif Ezzat, Rachel Havrelock, and Kathleen Blackburn. Support from the Charles Stewart Mott Foundation brought Freshwater Stories into being. We are deeply grateful to the communities around Lake Michigan who helped us shape the project through a series of workshops in the summer and fall of 2017.